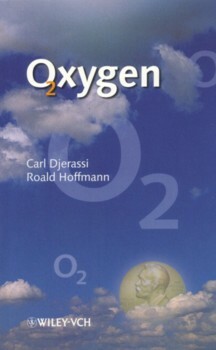 Tomorrow I am going to see Professor Carl Djerassi at the British Library. His talk is to be called 'NOBLE SCIENCE AND NOBEL LUST' and promises to show some of the 'pros and cons of Nobel lust' through his lecture, readings and video presentation. It starts at 18.30 in the Conference Centre at the St Pancras Library. A 400 mile round trip is perhaps a little excessive for a 90 minute talk but I am very interested to hear about his genre 'science-in-fiction'. I have already read his play OXYGEN (which he co-wrote with Professor Roald Hoffmann - a Nobel Laureate) and found it fascinating. It deals with which of the three scientists Lavoisier, Priestley or Scheele could most lay claim to the discovery of oxygen. 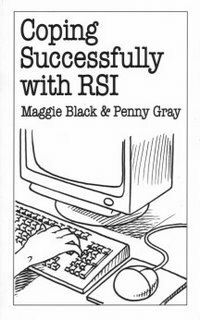 Thanks to all the tips and recommendations my RSI is now much better. It no longer hurts at night and apart from a little stiffness during the day is quite tolerable. But I have had to change my life. Everyday I make sure I stretch and take exercise, sit at the computer properly and take frequent breaks. It is quite a regime, but worth it if it means I can carry on writing. Thanks to everyone who gave advice - it was much appreciated. A few weeks ago I met my mother in Nottingham. Nottingham, of course, is famous for its castle, its sherrif and its outlaw, Robin Hood. Nottingham is also the birthplace of one of my favourite authors, D H Lawrence. 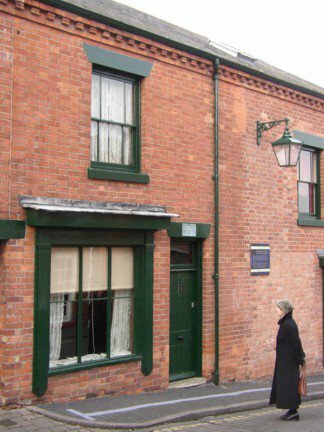 The house where he was born, actually in a village called Eastwood about ten miles outside the town, has now been converted into a museum. The place has been preserved much as it was when the Lawrences lived there. 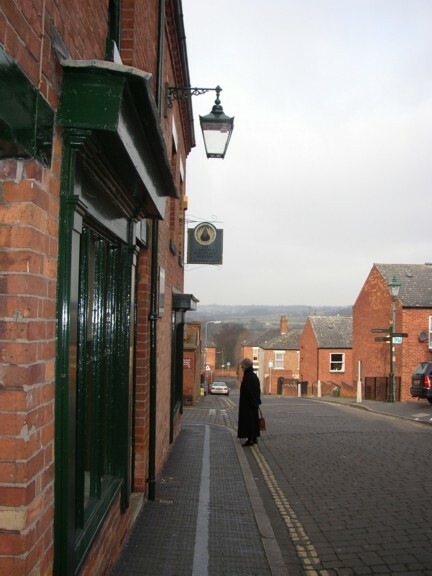 It was an end terrace, the museum shop having been built on later, and here is my mother standing outside. D H Lawrence was devoted to his mother. She was well-to-do in comparison with Lawrence's father and had been a teacher - which is probably one reason why he read and wrote so well. 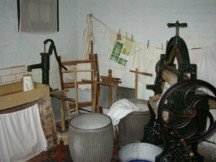 From the museum shop you go into the kitchen with its range, sink (without running water), sewing machine, table and chairs and stairs off leading to the bedrooms above. The only other downstairs room in the house was the parlour which was kept for special occasions. This had a grand fireplace, the obligatory aspidistra, dresser, a piano and bookshelves. It also had a large window and deep window sill - Lawrence's mother sold items such as baby clothes. However all shop business was done in the kitchen via the back door. The front door was kept for important visitors such as the minister and also the coffin. The table was covered with a thick cloth. Apparently this was supposed to be a feature of Victorian prudery - the table legs were supposed to remind people too much of naked legs and so had to be covered. However, according to a very interesting book I am reading at the moment (HOPE AND HEARTBREAK: A Social History of Wales and the Welsh 1776-1871 by Russell Davies) this is a myth. The table legs were covered merely to prevent scuffing by hob-nailed boots. 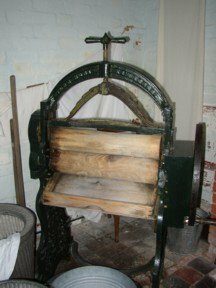 The Lawrences were lucky because they had their own backyard and off this was a wash house with dolly tub, a copper for boiling water, a mangle, stove and a few washboards - all very interesting. Upstairs there were two bedrooms - one for the parents and one for some of the children, and then up some more stairs there was another bedroom in the loft. There was little in these rooms except the bed, a chest of drawers and a table with a jug and basin. People needed so much less then than they do today. I found the street unusual - a row of terraces, the sort you generally find in the middle of town, but these led to open fields and we were able to see the same view of countryside that Lawrence would have seen because little seemed to have changed. David Herbert Lawrence didn't live long in this house. They were an upwardly mobile family - they moved within the village to another larger end terrace and then a semi-detatched house. Lawrence didn't seem to like Eastwood or its inhabitants very much, and once he left he rarely came back. He went to university in Nottingham, and thentaught in Croydon before eloping with Frieda, the wife of one of his teachers, to the continent. Like most writers he seemed to lead an unhappy life, forever flitting around from place to place - the fact that Frieda was German and related to the famous Red Baron probably did not not help matters very much, especially during the first world war. He died at the young age of 45 of tuberculosis. There is a very interesting website devoted to his life in Eastwood here. Well, I much enjoyed my afternoon at the University of Salford - a good appreciative audience at the reading and then a talented lot of students in the workshop afterwards. I felt most welcome. My thanks to Ursula Hurley and Scott Thurston who run the Creative Writing undergraduate courses there. 4 ...and the Barcelona Review. I am sure there are other websites offering publication of short stories. Then there are magazines such as the People's Friend and Mslexia which cater to different tastes. Mslexia only takes pieces from women and I don't think they pay. In all cases the standard advice is to read examples to assess house style and to see if it matches your own - but I am sure you know that already. Then there are prestigious competitions like Bridport and many other national and more local competitions, most of which require a fee to enter. 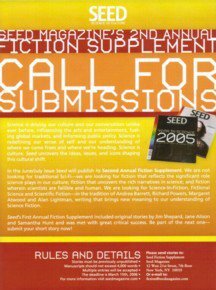 Jason Erik Lundberg's latest podcast has excellent advice on submitting short stories to an editor as well as important information on how to properly eat chocolate. 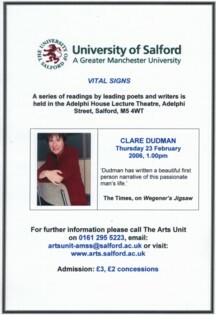 Tomorrow I am going to be visiting author at the University of Salford. I shall be reading and conducting workshops for students on the short fiction module. Looking forward to this very much. In case you can't make out the writing the venue is Llay United Youth Football Club, and features 'some of the world's quckest and funniest snails'. Unfortunately it neglects to give a time but I intend to be there, camera to hand. Andrew Holmes, author of 64 CLARKE, has organised something called SECRET SANTA'S MIXTAPE EXCHANGE. A group of us, many of whom are authors of stories in PERVERTED BY LANGUAGE (an anthology of short stories inspired by the titles of tracks by the FALL to be published by Serpent's Tail in 2007), compiled a mix of tracks on a CD then sent them to Andrew. He is now sending them on (anonymously) for us all to 'criticise'...can't wait for mine, also can't wait to hear what someone makes of my mix. It's going to be shockingly bad - but I don't care. This post will be brief. My arm is aching all the time now, but especially when I write and also at night when I am trying to get to sleep. I have used up a large tube of ibuprofen gel in a week. When I went to the doctor she suggested that I change my occupation but that is not possible - writing is what I love, it is much more than a job to me. So instead I have turned to books and am following the instructions in this one. So, accordingly it was yoga yesterday, aerobics today (I'd given them up thinking the best thing to do was to rest) and stretches whenever I remember. I am also trying not to spend more than 20 minutes at the keyboard without a break, and this week end Hodmandod Senior is going to take the plinth off my desk because we think it might be too high...and I have changed from my desk computer to my laptop to avoid using the mouse. If anyone reading this has any other tips I would be very grateful to hear them. Some kind person (or persons) from MIT has put all of Shakespeare's plays on the internet, and since I have so much to do I keep myself awake wondering how I am going to do it all, and my arm is aching through too much time spent at my keyboard I am sad to report the start of another obsession - a study on the use of snails as a metaphor or simile in the works of Shakespeare. This is a direct result of my interview with the talented Mr Norminton so I am blaming him. But two separate references in AS YOU LIKE IT. The second reference in Act 4 scene 1 is a lot more amusing. Rosalind expresses her admiration for the snail because although he advances slowly at least he can offer a woman a place to live (the house on his head) and also comes armed with a horn so that he can defend her honour. Shakespeare, quite obviously, was a snail enthusiast. I am very pleased to report that in August I am going to be a visiting author to a special interest holiday group in the Languedoc in France called 7 DAY WONDER. When I was a child I used to have a poster of a small village in the Languedoc-Rousillon area of France. It was on the top of a small steep hill and all the buildings were the colour of honey. The surrounding mountains were covered in dense green forest and I used to love imagining myself living there listening to the people around me talking in the language of 'Oc'. My book 98 REASONS FOR BEING is going to be translated into Dutch - the contract arrived this morning from AMBO-ANTHOS which means that my book will have some excellent literary company. I am delighted about this because it is the first time anyone is going to translate my work into another language. ...is in Ambergris, a fictional world of silences, spores, and an underclass race called the greycaps who are just biding their time and waiting for their moment. The bookshop itself though is real (as well as virtual and imaginary) and open for business. Just click here. The snail wakes - stretches out - life is too short to mope it reminds itself, and even though the sun is not yet shining does its best to slither forwards. 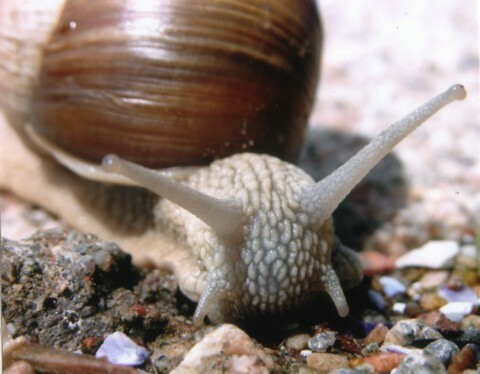 Here is another brilliant photo of a snail by Sandra Johnson. She found it on the west coast of Sweden. It looks as if it keeps its brains on the outside of its head. 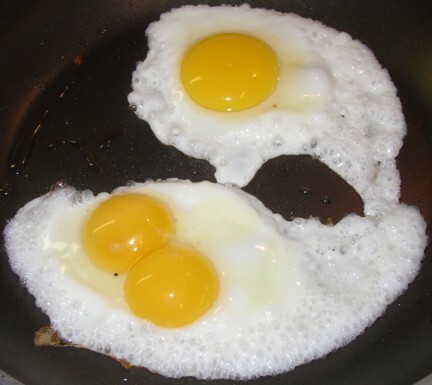 I am pleased to report that Sandra has started her own blog 'Cathy Timberlake' which will, in due course, feature some more of her excellent photos and also, I expect some of her very funny self-effacing anecdotes. The snail is going to sleep for a while. Bye bye for now. Delighted to see that the American title of my book has inspired someone to write a poem! I particularly like the 'a confederacy of fingers gloving soft the ridges' and the ending - a strong simple command just to 'listen'.